CRAZY CUSTOMS: 10 WEDDING TRADITIONS AND THE REASONS BEHIND THEM THAT YOU WON’T BELIEVE! 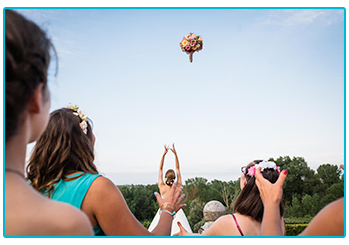 Your wedding day can be a truly magical occasion and create memories that last a lifetime. With all of the planning that takes place, there can be whole host of details to get sorted before the big day; from catering to outfits. On top of all of this, there are also some very traditional, often strange, wedding traditions that take place. 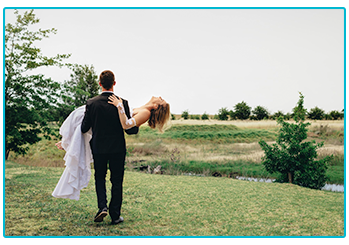 At The Insurance Emporium, we love some of the remarkable rituals that go on at weddings but can’t help but wonder why they’re so common! That’s why we put together this guide on the reasons behind some weird wedding customs! 2. Give it away now! This father and daughter moment can be one of the most emotional parts of your big day! However, it actually dates back many years to a time when a daughter was considered the property of her father and sold to the groom – giving away his ownership! Truly heart-warming! Most people will have heard the famous phrase before but most of us probably have no idea why we do it! The ‘old’ is to represent the past, the ‘new’ is the future, ‘borrowed’ is the happiness given to the bride by her husband and ‘blue’ is to ward off evil! Many years ago it was considered good luck to remove and take home any part of the bride’s outfit. This custom often became quite a harrowing experience for the bride, with guests stopping at nothing to rip away a lucky charm! Therefore many took to throwing the bouquet into the crowd and taking off! On the face of it, appointing a group of bridesmaids probably doesn’t seem that weird a tradition. However, many of the bride’s ‘squad’ might not realise that their original primary role would be to protect the bride from evil spirits! If you want to keep those ghouls away from your wedding, who ya gonna call?! For many, a romantic honeymoon in an idyllic location is the most exciting part of the whole adventure of marriage! For Viking couples this wasn’t quite a romantic fortnight in Bora Bora, instead they’d spend 30 days in a cave, being supplied with honeyed wine by family members! Cosy! 8. Don’t look at me! For some, avoiding seeing your partner might just be an excuse to swerve them for one last night before committing to a life together! It actually dates back to the days of arranged weddings, where a groom would be kept away from their wife-to-be just in case he didn’t like what he saw! In Wales, you might find the bride carrying herb called myrtle in her bouquet. This is said to symbolise love and is cut off and given to each bridesmaid. If each bridesmaid plants it and it blooms then they’ll be the next bride! Failing that, they could just chuck it in a spag bol! If you happen to live in Jamaica, you might find villagers lining up in the street to take a look at the bride. It all sounds lovely, doesn’t it? The reason for this is to call out comments on her outfit. If the majority are negative, the bride must go home and try again with a different look. Sounds like a real confidence boost! Many of these classic wedding traditions are still observed today and can add that touch of magic to your special day! It’s always nice to know the meaning behind some of these customs before you start throwing bouquets and handing out herbs! It might also be useful to invest in some wedding insurance to help cover your marital adventure! 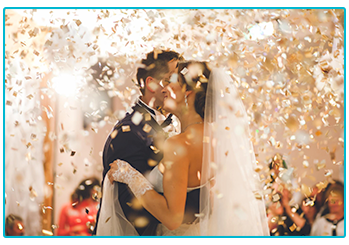 At The Insurance Emporium, our Wedding Insurance policies can be set up with a simple one-off payment and you have seven levels of cover to choose from! Lift the veil on The Insurance Emporium to find out more!